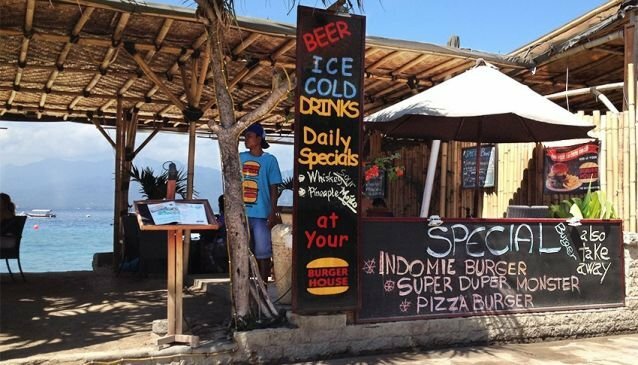 Dream Divers Burger House, located at Dream Divers, on the beachfront in central Gili Trawangan serves breakfast , snacks, lunch and dinner. Traditional European and Indonesian cuisine and a delicious variety of stylish and tasty burgers is offered using the best quality ingredients. The chef is always coming up with new tasty burger creations! Enjoy your sunset beer or cocktail at the bar just beside the pool in a relaxed atmosphere and from 18.00 grilled fish, steaks and seafood are on offer. If you are looking for somewhere to relax and enjoy your dining experience this is the place to go! Dream Divers offers accommodation and scuba diving activities from fun dives to Instructor courses and snorkelling. Just perfect you can Dive with Dreamdivers, then Chill out at the Beach Burger House. Dive, Eat, Sleep at Dreamdivers! Dream Divers, where Your diving Adventure and the Gili Lifestyle Experience starts.